The global identification gap is a significant challenge for sustainable development. We hope the new Principles on Identification are an important step to closing it. In the modern world, many everyday transactions—such as opening a bank account, registering for school, activating a SIM card or mobile phone, obtaining formal employment, or receiving social transfers—require individuals to prove who they are. For the estimated 1.5 billion people in developing countries who lack proof of identity (World Bank data, 2016), this creates a serious obstacle for full participation in formal economic, social, and political life. Like individuals, governments also need robust, secure identification systems to perform core state functions and administer many of the programs and services vital for development, including social transfers, education and healthcare, and emergency and disaster response. In Thailand, the national ID number has helped the government achieve universal health coverage, making healthcare more cost-efficient and accessible. Peru’s comprehensive registration and identification system has unlocked new opportunities for indigenous and marginalized children. In India, the Aadhaar identification and authentication system enabled millions of people to open bank accounts, and helped the government reform its social transfer programs. Yet the path to creating robust identification systems and achieving Target 16.9 is not always clear. In the past, many countries, development agencies, and NGOs have focused on identification from a narrow, functional perspective, and, in the process, created fragmented and inefficient identification systems with limited coverage. Given the size of the global identification gap and the complexity of identity issues, no country, international organization, NGO, or private sector partner can surmount this challenge by working alone—coordination is needed at global, regional and national levels. Furthermore, there is no universally applicable ‘model’ for the provision and management of identity. Policymakers have a variety of legal, institutional, and technological arrangements to choose from, each with its own set of advantages and drawbacks. At the same time, technology is advancing rapidly, creating new opportunities and challenges. The use of digital and biometric technology like fingerprints and iris scanning has become almost ubiquitous, while improved connectivity in many developing countries has spurred demand for remote authentication. Such diversity and continuous transformation requires a common understanding of the characteristics of identification systems that make them beneficial for development and a commitment from diverse stakeholders to build systems that meet these criteria. With this objective in mind, more than 15 global organizations have jointly developed a set of shared Principles that are fundamental to maximizing the benefits of identification systems for sustainable development while mitigating many of the risks. 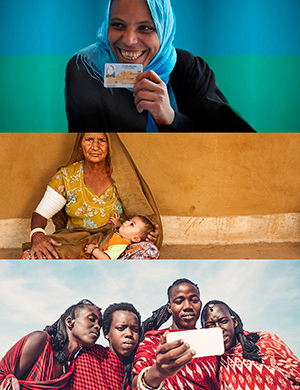 By shaping and endorsing these principles through a series of consultations, these organizations have taken an important step towards developing a broad consensus on the appropriate design of identification systems and how they should—and should not—be used to support development and the achievement of multiple SDGs. By applying these Principles, stakeholders including the World Bank Group, through its ID4D initiative, will be better able to align their support of country identification systems according to a set of shared values and standards. 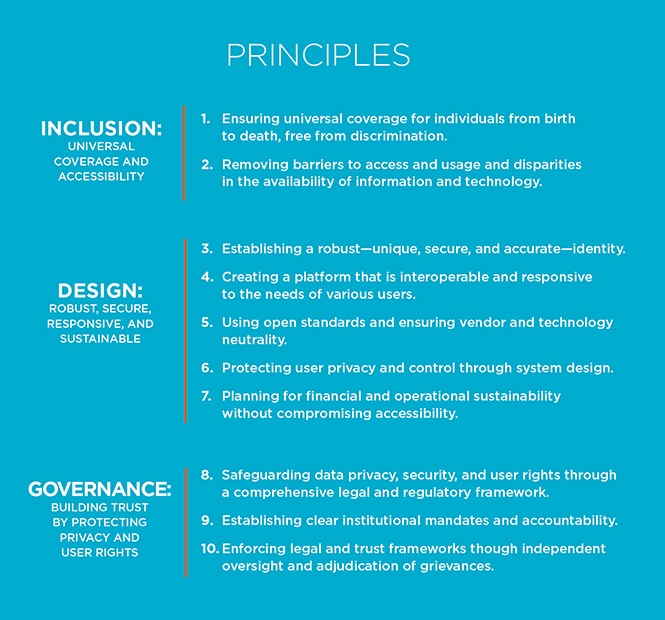 These Principles are the beginning of what we envision to be a process of continued cooperation and consultation among an expanding group of stakeholders. As with successful identification systems, we believe that the Principles must evolve over time as new technologies become available and lessons emerge from implementation. We have thus agreed to come together periodically to incorporate new learning into these Principles and strengthen global cooperation to provide legal identity for all.